A House Peepers Confession and the Perfect Cure - House Hunters on HGTV! Hi. My name is Shelley, and I have a problem. (or at least that's what Cason likes to call it) ha! I'm literally OBSESSED with trying to get a peek into peoples homes, to see what they look like! Forget the people... I just want to see what sort of layout you have, what your kitchen cabinets look like, or what paint colors are on your walls. Cason first became aware of my little 'guilty pleasure' when we were newly married and taking a walk at night in his parents neighborhood. More then once I stopped dead in my tracks to try and get a good look through a few homes lit up windows... always squinting to sneak a peek at how other people decorate, live, and what kind of things they surround themselves with. Do I sound like a total creeper now, or what!? jeesh. Okay, just for the record, I don't actually walk UP to houses or peer in windows for strange amounts of time with a black ski mask on... it's just more of a once-over "how are ya'll livin' in there?" kinda look. Who here LOVES going through model homes? I'm pretty sure that most of you are thinking... "Oh yeah! Can't get enough!" Well... it's basically the same thing. Those homes are set up like people are living in them, no? From fake fruit out on the counter, to the never worn his & hers bathrobes in the master bedroom closet. It's the intrigue of living life in a beautiful, new space that makes us crave those model home experiences. So that being said, it's only natural that between my nosey nature, and Cason's need to one day visit far off places, that House Hunters and House Hunters International, are pretty much two of our favorite shows on HGTV. Really... it's perfect. Now we can just lay in our bed while other people do the work of showing us beautiful new countries and sneak peeks into complete strangers homes. If you're not familiar with the show then you can check out the House Hunters Facebook page and also tune into the all new House Hunters International Season Premier, TONIGHT on HGTV at 10:30/9:30c. While you're waiting, you can catch up on past episodes online. Oh, and you DEFINITELY don't want to miss this next part... My cute friend Allison from Petit Elefant will be hosting a live Twitter Chat party during the House Hunters International premier tonight, and she'll be telling you all about how to win an iPad 2, with the new HGTV to GO App on it! 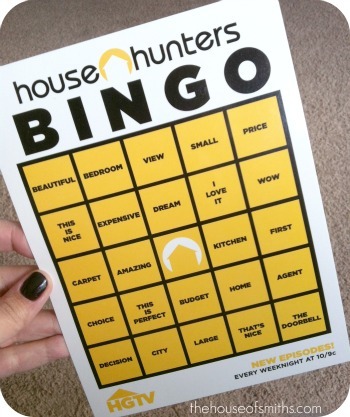 You can also download these fun House Hunters Bingo cards here. Ya, you better believe that I've already got mine ready. Cason and I are super competitive and we always try to see who's going to be right about which house the buyers will pick on the show. I'll admit, I'm usually wrong, so maybe having a leg-up on bingo will help. ha! Whada' say?...Are you ready to join in the obsession of peeking into homes with me!? You never know what kind of ideas or styles that you may be exposed to, just by simply seeing how "the other half" lives. No Shelley!!!! I TOTALLY understand! Except, I would be willing to sneak behind a bush just so I can see a living room's layout! You are not alone with this disease. I too like to peer into windows of the unsuspecting innocents. The older the house, the more likely Ill be slowing on your block. I LOVE peering into other people's houses....in the non-creepy way of course! hahaha I LOVE this post. So honest. And I KNOW there are TONS more peepers out there! I am! I'm feelin' ya on this subject! I am a total 'stop in my tracks on a walk' or 'make my husband back up the car' so I can look in someone's windows. Like you, it's not like I'm going up to the window to take a peek, I just LOVE seeing what they've done with their space. I'm an interior designer, so it's in my nature. I can't help it!! I am totally the same way! It is a total guilty pleasure. 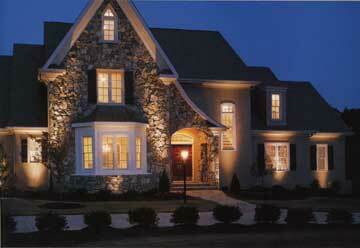 My uncle has a custom installation business (lights/security systems/home theatres)-mostly in giant fancy homes. So I've been able to go in a lot of them, and it's my FAVORITE! One home actually had a shooting range in the basement. A shooting range. I'm so glad I'm not the only house peeper/creeper! Bike rides on a late summer evening just as it's getting dark is the perfect time to be peeking in peoples homes because they haven't shut their blinds yet! (is that horrid that I know that??) I'm an avid House Hunters watcher too! Phew.. I thought I was the only one. I am with you. Love to snoop! Have u ever been to the website "Hooked on Houses?" This genius of a blog is my favorite way to get my "house fix!" It is literally a treasure trove of house snooping. From celebrity homes, homes you see on movies and t.v. shows to hilarious real estate listing photos and before and afters! It is amazing! I am personally fed up with House Hunters (it is all that is ever on HGTV anymore and we don't have TiVo ) so this is my new favorite pastime when my hubs wants to watch sports! It is addicting! Oh I used to loooove house hunters, and I totally do the checking out the decor of people's houses (while walking past on the street) if they happen to have their window blinds open & the lights on. (They must know people can see in!) Sadly, I now don't have cable, so I haven't seen many hgtv shows in a while now except for a few here & there online. We're hopefully getting cable again very soon though!! Oh I too am a house peeper! I love to see how people live and decorate. AND House Hunters and House Hunters International are my favs as well. I can't wait for the premier. Yeah! I can't tell you how many times I have complained to my hubby that more people need to keep their blinds/ curtains open! I love House Hunters too! My favorite part is at then end when they show them a few months after they've moved in and you get to see what changes they've made and all that. So fun! Oh, and I'm a peeper too! :) So you're not alone by any means! I am the SAME way! I love peering into other homes, moreso to see the home than the decor though. Oh my goodness! You are a girl after my own heart! I love seeing how the other half lives! I always watch House Hunters and hubby and I always bet on which house they choose, too! My son has even gotten in on the game. We are HGTV house hunter obsessed at our house. My favoite, House Hunter. My husband's, International House Hunter. Have fun watching. can I just say that i LOVE this? i have a similar obsession and feel like if you leave windows open and lights on you're ASKING me to look inside. house hunters is one of my favorite shows as well-i'm totally intrigued w/ the buying process and can't understand how people can NOT see past paint colors! sheesh! think outside the box people! anywho- I'll be tuning in! This posts made me laugh so hard! I've always loved peering into people's homes. In fact so much so that my friend and I would plan our nighlty walks in certain neighborhoods just to get glimps into LR, DR, BR etc...so much fun. I fully admit to watching House Hunters and don't care if it's one I"ve already seen...sometimes I imgine what I would do if it was my house. Good to konw there are lot's of house prowlers out there :) Could we make a club or what! Oh good LORD! Are you sure we aren't long lost sisters or something?!? My husband doesn't get my obsession with looking at/in people's homes and their decor. I love a good open house too. Ok-ok...I admit it! I've even made up fake names/numbers at open houses when the realtor asks or we have to sign in. I use my doggies as an excuse to check out neighborhood homes on our nightly walk (oh dear, do you have to potty right here- as I peer through the open window). Oh and I'm a definite online home stalker as well. Love me some House Hunters too...stoked for some new episodes! I truly didn't know there were others out there! Hello...my name is Dar...and I'm a house peeper! Ooooo..I am such a House Hunters nerd and a model home junky although there aren't many where I live anymore. When I meet people I always wonder what their houses might look like. So weird..So fun! oh my LORD! Are you sure we aren't long lost sisters or something?!? My husband totally doesn't get my "sickness" with house peeping! I use my doggies on our nightly walk to peer into others homes (oh my, do you really have to go potty here? - as I secretly peek through their windows). I love me a good open house. Ok-ok, I admit it! I've even given the realtor a fake name/number when asked or had to sign-in. I'm an online home stalker as well. I could surf the web for hours! I love me some House Hunters too...stoked for some new episodes. I truly had no idea there were others with the same "sickness". Hello, my name is...Dar, and I'm a house peeper! I am the exact same way!! That's why I love House Hunters!! My hubby and i like to try and guess which home the people will choose too! I absolutely LOVE House Hunters and Inter.!! They are in my top 5 favorites shows and are always watching them. It's one of the main reasons why I am going into Real Estate school right now :) I agree with other comments, people need to look past the paint colors! Love this post! PS. Property Virgins is also another favorite! Well pretty much anything on HGTV is awesome!! I am! I am! With YOU!! There is a house I am madly in love with. If I had the nerve, I would knock on the door and plea my case... on hands and knees (more dramatic) and beg to see the inside!! Heck I'll even clean it for a tour! LOL! A girl can dream... I am a house peeper!! I love the end where they say "SIx months later....." and you can see what they DID with the home. That's the best part for me. How fun that Cason watches with you! My hubby retreats to his man cave in the attic. OMG...I love House Hunters. I can't get to bed at night because I'm up watching it. Anything on HGTV is my favorite. Yes, I am a peeper, always have been, in fact in our new neighborhood we live in now there are a few houses I am trying to "peer" in because they look so "yummi" if you will, you just have to do it really sly, like maybe have your child stop on their bike and pretend you are talking to them but are really looking in someone's house!!! haha! Your not a Creeper cause if you are, I'm one too!!! ha ha I am always curious how people live. I live in South Dakota and it seems that we are "behind" in terms of architectural layouts and that most people don't really have that desire to really decorate that great.... it's sort of depressing in a sense so I am always wanting to see if there is at least one other family out there who cares about their house!!! Ok Shelley, I've been "peeping" in on your blog for a little over a month...and I just love you! (I'm sure you get that all the time.) My hubby also discovered my little guilty pleasure shortly after we were married. We'd be driving around and I'd make him slow down so I could get a better look into homes. I think at first he thought I was a total perv! Love this post, thanks for the laughs! Count me in ... house peeper here! 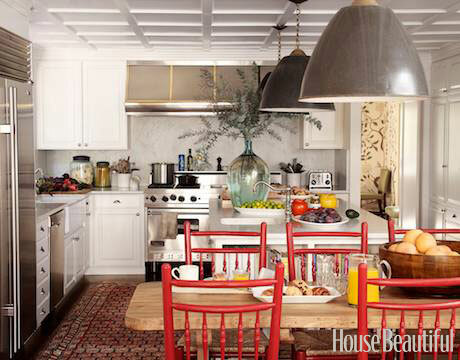 Of course, I think ALL design bloggers are house peepers for sure! But you're right, long before I had a blog, and long before HGTV even existed (yeah, I know, I'm showing my age) I used to go to decorator showcases, open houses, etc. Now being a house peeper is so easy. I simply go to my email inbox everyday and read the dozens of beautiful blogs I subscribe to ... just like this one! Ha I'm a creeper too. Thats why I leave my blinds up so other can take a look. Love your post and will have to check out the show if its on hulu since I don't have a TV. If you remove "Shelley" and "Cason" and replace it with "Jamie" and "Josh"...it would like I wrote this post! (thank goodness there are others like us)!!!!! I am a total creeper peeper. I have even contemplated getting my real estate license so I can peep even more! Sounds like you need to be a member of Looky Loos of America. A completely fake group my friend Philip and I started waaaaay back in college. We were the only members. We would dress fancy. Borrow his parents Jag and go to all the open houses in the fancy L.A. Neighborhoods just to see the architecture, floor plans and interior design. It was so fun! Too hard to do that today. None of those neighborhoods have open houses anymore. This was in the late 80's early 90's so the decorating was, well, not so good--lots of Dynasty! Thanks for triggering a great memory. Peepers unite! That bingo card needs "ooh, granite countertops and stainless steel appliances!" "This closet will be big enough for my clothes, where will you put yours, honey?" "This kitchen needs to be updated" and "Where is the space for my man cave?" - then you'd totally win! That bingo card needs "ooh, granite countertops and stainless steel appliances!" "This closet will be enough for my clothes, where will you put yours, honey?" 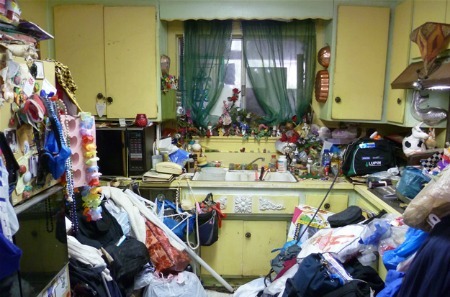 "This kitchen needs updating" and "Where is the space for my man cave?" and then you'll totally win!